A crowd gathered for the 2011 Live United Awards at the Grand Rapids Civic Theatre last night. The evening celebrated the close of Heart of West Michigan United Way’s annual campaign and recognized local individuals and organizations that have made an impact in our community. During the ceremony, at which the United Way's 2010 campaign impact total of $25 million was announced, The Volunteer Center honored three local companies and one nonprofit agency for their volunteer work. 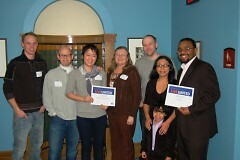 The awards were presented by United Way's Project Blueprint graduates Linda Kennedy and Bunmi Fadase. 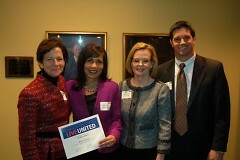 Fifth Third Bank received the “Above & Beyond” award for being one of the Volunteer Center’s most committed partners. Recognizing that meaningful volunteer service does much for their employees and their community, Fifth Third has been a long-time supporter of United Way’s Day of Caring, our community’s largest one-day volunteer event. Every year more than 150 Fifth Third employees participate in Day of Caring. Fifth Third is also a committed partner with a new Volunteer Center initiative working to end homelessness and increase the supply of affordable housing in West Michigan. Fifth Third representatives participated in the Reframing Homelessness Bus Tour last summer, then shared information on our community’s efforts to end homelessness with their employees. 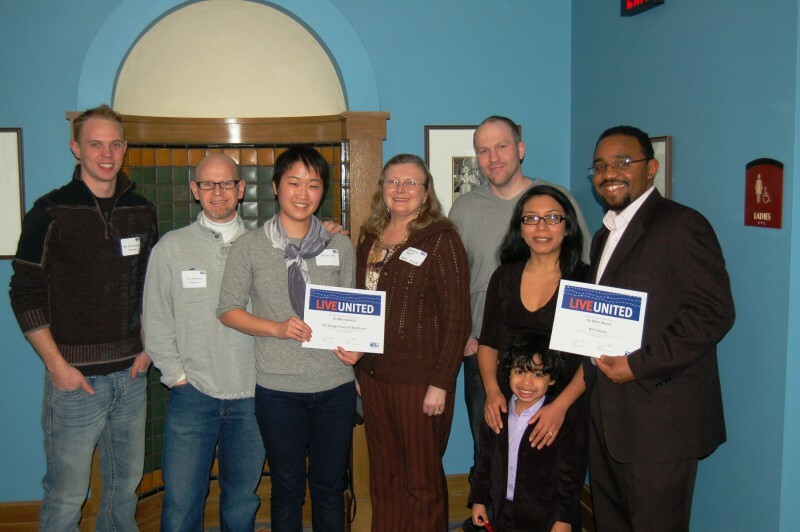 Additionally, 15 employees from Fifth Third have graduated from United Way’s Project Blueprint, a leadership development program for individuals of color. 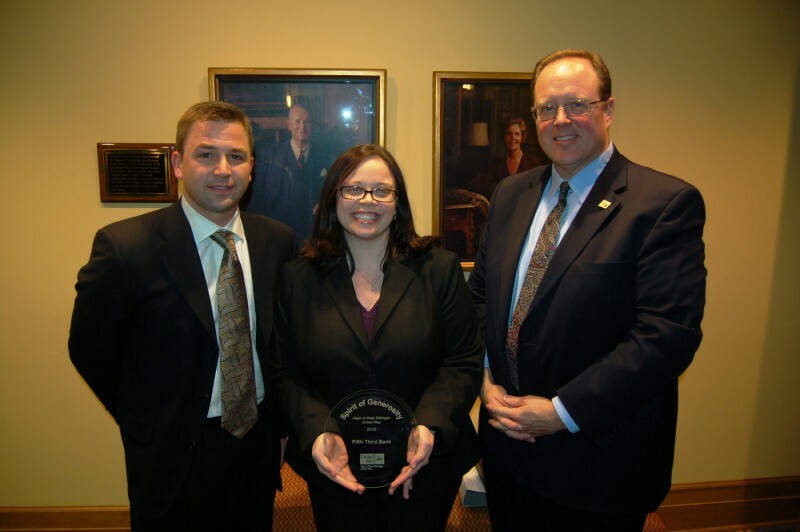 The “Do More” Volunteer Center award was given to the law firm Miller Johnson in recognition of their leadership and volunteer support contributing to the success of the annual Martin Luther King Jr. National Day of Service each January. The MLK Day of Service is the only federal holiday observed as a national day of service – a "day on, not a day off." 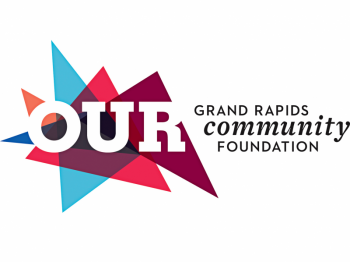 For the past two years, over 142 Miller Johnson employees (nearly 75% of their staff) have volunteered each year at 16 not for profit organizations throughout West Michigan. 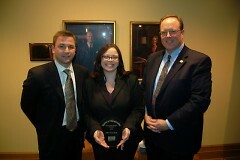 This year, over 24 service projects were completed by Miller Johnson attorneys and staff. Among the organizations they served include Kid’s Food Basket, the American Red Cross, Arbor Circle, Degage Ministries, Catholic Charities, and more. A second “Do More” award handed out last night acknowledges a partnership that is participating in an important community change – the Vision to End Homelessness. Well House, a member of the Coalition to End Homelessness, is working to build an environmentally aware community with a base in three inner city houses. Recently, Well House made the transition from an emergency shelter to providing permanent housing. The Design Team at Steelcase has offered their time and their talents to work with Well House to re-imagine their space to reflect the changing needs of the residents who are now permanently housed there. Both Well House and the Design Team are using innovative methods and skills-based volunteering to address living and workspace issues within the former shelter. You can learn more about this exciting ongoing project here. Our thanks to each of these deserving award winners for their commitment to working hard to make our community a better place!